The foremost virtue on each of these albums -- musically, lyrically, and especially vocally -- is Forbert’s exuberance, the unabashed joy of discovery he makes palpable on nearly every one of the tracks here. The 'new Dylan' mantle is probably the most damning comparison in pop music. It inspires almost immediate skepticism, and it saddles the anointed with an impossible burden. After all, Dylan never went away and he hasn’t yet (and the way things have been going lately, he never will -- have you heard Tempest?). To boot, it’s a lazy signifier. When critics or publicists break it out, they invariably mean only that the so-called “new Dylan” has an unusual voice, nebulous folkie leanings, a certain way with words, or all of the above. When Steve Forbert arrived on the scene in the late '70s, he too was given the dubious honor and it haunts him to this day. Look him up on AllMusic and you’ll see it right there in the first line of the bio. The liners to this deluxe repackaging of Forbert’s first two albums allude to it, too. And given what we know about the comparison, it’s pretty easy to see why folks were and continue to be so loose with it. 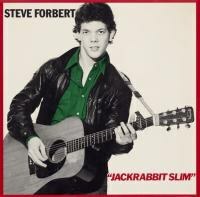 On both Alive on Arrival, Forbert’s 1978 debut, and Jackrabbit Slim, the 1979 follow-up, we hear a guy with a strange voice, an acoustic guitar and lots of words. Here’s the thing, though: if you actually listen to the records, it becomes clear that the two share only these very broad similarities. What we have in Steve Forbert is a quite different kind of artist, one who positions himself in almost total opposition to Bob Dylan. Alive on Arrival kicks off with the gorgeous “Goin’ Down to Laurel”, a shimmering piece featuring bright acoustic guitar, lovely piano, loping bass and a melancholy steel guitar chiming just below the music’s surface. Most importantly though, there’s his voice, irrepressibly young, playful and earnest. Forbert’s lyrics, at once knowing and naive, are perfectly fitted to that voice, mirroring the charm of its peculiar grain: “Well, I’m goin’ down to Laurel / It’s a dirty, stinking town, yeah / But me, I know exactly what / I’m going to find." Simple stuff, to be sure, but it perfectly captures that critical moment when one’s personal confidence and optimism (the singer knows exactly what he’s going to find) come up against the hard, often antagonistic, facts of the outside world (i.e., the dirty, stinking town of the song’s title). Alive on Arrival is bursting with such gems. “Steve Forbert’s Midsummer Night’s Toast” is a stripped back counterpart to the lead cut, boasting wonderful lines about “roads of burning tar and hot cement” and “money in my hand and where it went”. “What Kinda Guy?” is driving rockabilly, an excellent formal choice that plays to the strengths of Forbert’s voice, which is given naturally to the genre’s hallmark mannerisms. Jackrabbit Slim is every bit the equal of the debut. As an album, it’s marked by a more varied sonic approach, thanks no doubt in part to the guiding hand of producer John Simon (perhaps most famous for his work with the Band). Where Alive on Arrival is dominated by a fairly basic folk pop aesthetic, Jackrabbit Slim incorporates electric guitar, organ, horns, and a backing chorus. More often than not -- I’m thinking “Romeo’s Tune”, Forbert’s lone Top 40 hit, “Make It So Real” and “The Sweet Love That You Give” (dig that horn section) -- the accompaniment and production work smashingly well, providing counterpoint to Forbert’s voice and words, which are as strong here as they are on the debut. As can be expected when any artist pushes against his or her creative comfort zone, there are missteps here. “Complications” is the most obvious offender, suffering from a rote reggae attack. Ultimately, however, both Alive on Arrival and Jackrabbit Slim are excellent albums, and they might well be classics of their form. The Dylan comparisons I mentioned earlier quite simply miss the point, as they usually do. The foremost virtue on each of these albums -- musically, lyrically, and especially vocally -- is Forbert’s exuberance, the unabashed joy of discovery he makes palpable on nearly every one of the tracks here. Dylan’s virtues are many, and I’m as big an admirer as any reasonable human being can be, but he certainly can’t be lauded for the same. Dylan has always been about mystery and distance. Forbert’s approach is all about openness of heart and inclusiveness. On that level, he’s without peer, as this package amply demonstrates.